Ever curious about things that flow, I did some research into the Tao. The Tao Te Ching is a text that is more than 2,000 years old. It is the foundation of the Taoist school of Chinese philosophy. Tao means “way” and the title of this book translates as “The Book of the Way and (its) Virtue”. Even without opening a copy of Ohno’s book, the parallels found in Taoist philosophy and the Toyota Production System philosophy were striking. In Taiichi Ohno’s Workplace Management he talks about the “game of wits” with subordinates. This involves developing the minds of people by giving them difficult challenges, and thinking about the problem yourself so that you can give advice to the subordinate as they struggle. Ohno said to give full credit for the solution to the subordinates (student). The Tao stresses harmony and flow and recommends a minimalist approach to leadership, whether it be as a king or a manager. There is a very Lean thought that runs throughout Taoism which says that the more one acts in harmony with the universe, the more one will achieve with less effort. Related to the harmony theme above, Taoism teaches that the harder one tries, the more resistance one creates for oneself, and the harder things become. We in the West might say “go with the flow”. The Taoist ideal of a doctor is one who has no reputation as a healer because the area or community they serve is disease-free. This can be extended to the ideal TPS (Lean) manager who appears to do nothing because he has prevented problems rather than acting heroically to solve them. Give a person a fish, and you have fed them for a day. Teach a person how to fish and you have fed them for a lifetime. The Tao teaches that when we stray from the fundamentals, we replace them with increasingly inferior ones and we deceive ourselves that these are the true values. This idea may not be unique to Taoist philosophy, but it is unique to find people who actually follow this thought. 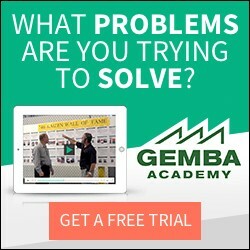 On your next gemba walk, remind each other what happens when you stray from the fundamentals, and consider taking the 2,000 year old advice about going back to basics. The history of chinese thought brings a wonderful context to helping us better understand The Toyota Production System. For example, Confucius, then Mencius as a response to Confucius, then to more modern Tao or Buddhism. As part of my training in Wing Chun Kung Fu, I get to read the Chinese Classics and am seeing a lot of parallels to Lean. er i mean why does taoism teach that the harder one tries the harder things become? “Why?” is a great question. I suppose it’s because the founders of Taoist thought believed it was truth. There is something called “wu-wei”, translated as non-action, inaction or non-doing. This is a key concept in Taoism. Peter mentioned kung fu, and aikido is another great demonstration of the non-doing concept. Aikido practitioners move along with their opponent instead of resisting the attacks. Likewise in business, we force the sale, force a product to market, force an incapable process, force deliveries to be met, force people to meet performance targets, etc. as common practice. Stopping (non-action) overproduction and other wastes and going with the natural flow to be in harmony with things is the Way. I don’t believe that in doing nothing there is nothing you won’t do. Lean, kungfu and aikido masters don’t stand there and do nothing either, they do let the customer or opponent lead and they re-act. I suppose I could discuss the virtues of sometimes non-opposing and non-opposition. (The snow pine and willow tree analogy come to mind) Non-action however on the other hand just is stretching it way to far I think, especially the part claiming you can do everything by not doing anything. I don’t think you’d really do anything by doing nothing. Now I suppose the next blog should be “Is Seinfeld really lean?” (show about nothing). During my aikido days our sensei taught that if two true aikido masters met in a fight, they would both sit down to drink tea. What would a quantum physicist say about “In doing nothing there is nothing you won’t do,” I wonder? I first realized the connection after reading Thomas Cleary’s “The Japanese Art of War: Understanding the Culture of Strategy” (Note this is NOT one of his translations, it is an overview of the genre.) When I read the examples of Zen literature and Cleary’s statement that they are from books that are still commonly read today I realized that Ohno’s TPS book is very much written in the same style. That is, it is written with the expectation that the student will fill in missing information and, therefore, learn partly on their own. Gai= The action to correct. San= This word is more related to the Taoism or Buddhism Philosophy in which give the definition as the action that ‘benefit’ the society but not to one particular individual. The quality of benefit that involve here should be sustain forever, in other words the ‘san’ is and act that truely benefit the others. Hi Rob. That explanation gives a deeper understanding of the “zen” or “san” part of kaizen as a lasting benefit for society, almost a moral good. This fits with the Toyota idea of “kaizen and respect for people” being the two pillars of a Lean system. Bumped into the fascinating “cutting up an ox” Taoist poem this week. Seems to fit this thread quite well!